Today, at 9.30am in Committee Room 2, Shire Hall, Warwick, there were twenty three people in the room. That included Councillors, WCC staff, one person from Dunchurch Community Group, but NO members of the public. My guess, holding a meeting like this on a Monday morning is a great time to get a zero turnout. It was about taking an in depth look into the WCC Libraries Report: jobs, closures and decisions. This will have a bearing on what is voted upon on Thursday 14 July 2011 in three days time. I've spent the last few days ploughing through all 326 pages (sure you've seen Parts 01-5). Meeting started with the odd words about who hadn't read the report at all, those who had read bits and then another who claimed you only need read 35 pages and disregard the rest. At this point, I'll tell you again, these are my thoughts as an observer in the room. I'm not referencing each Councillor on a who said what and when. 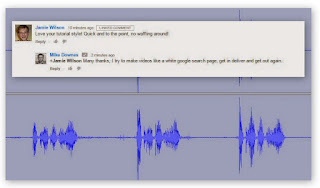 That's what I did last time on 4 March 2011 - many people seemed to like that. 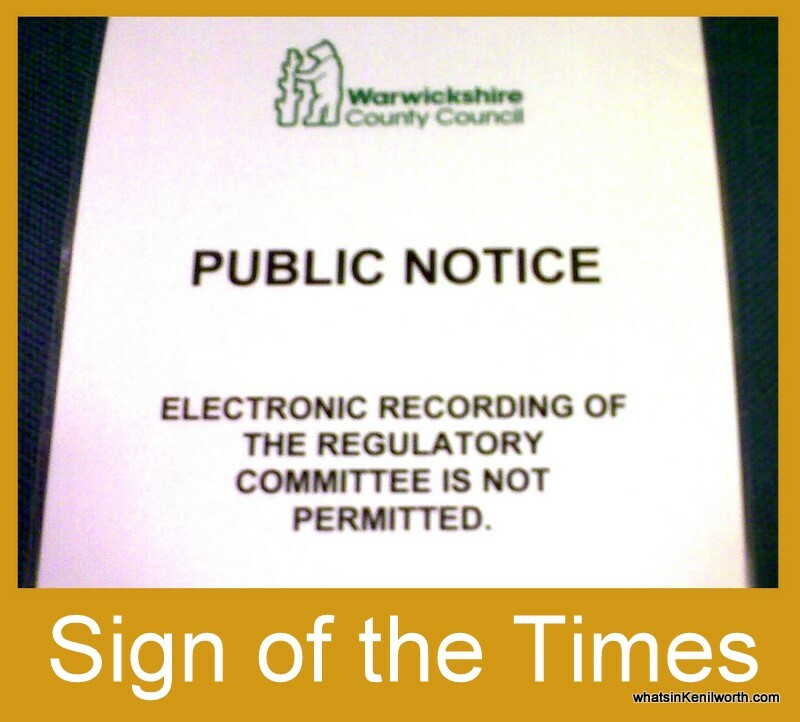 It seems proper reporters do that, and as I keep getting reminded at Shire Hall - I am a member of the public. This is now a standing joke with some other media types I know (you know who you are). If I was honest, I expected at least some press types at the meeting today. I hope this isn't what will happen on Thursday. Then again, after asking too many questions about democracy and how we spread the word, I arrived to find a sign waiting for me, PUBLIC NOTICE: ELECTRONIC RECORDING OF THE REGULATORY COMMITTEE IS NOT PERMITTED. So, I've been told. The message I've just had back from WCC is all to do with due process and voting. There was another reason, but as hard as I try it escapes me. I thought Eric Pickles wants the public in meetings like this with a camcorder strapped to their wrist. He does - Warwickshire doesn't. Part 02 to follow very soon. For some Councillors to vote on a paper they haven't even read or those who have "disregarded" the majority of it's contents, is quite simply breathtakingly insulting to all the hard-working staff who livelihoods depend on their decision. I wish you would have named and shamed the Councillors who couldn't be bothered so similarly their constituents can return the favour come election time. It really just shows what a farce these committees are when all along the decisions have been made. I expect they can have a nice lunch and claim a few more expenses, so all's not lost, is it? As for those pesky library staff, well, they'll soon be out of your hair. My comments were meant as a narrative. I have a reporters pad with 20 pages of notes. The OSC was a discussion about a topic, in this case libraries. I am sure if Councillors knew a camera was rolling, they would not have made off the cuff comments like that. Same is true if a dozen public were sat at the back. If one Councillor asks some really searching questions and the reply comes back quite vague - what is their to report? This was 2 1/2 hours of discussion. What I am surprised about is the lack of VISUALISATIONS. The room is equipped with a data projector and screen. NO LAPTOP was hooked up to show on screen data (or the report). Even in the 1986 movie Top Gun, they was huddled in a classroom watching videos of dog fights. Classrooms all have data projectors - it's the norm. If someone says, 'page 245 statistic' - it should be on the big screen in seconds. 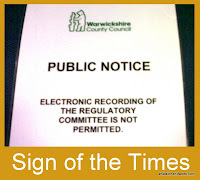 I'm not at all impressed by the sign at the meeting that prohibits electronic recording of the meeting. I'd like to know why, seeing as it was a rather important meeting that I'd liked to have watched. If Warwickshire County Council refuse to stream their meetings online, I was relying on sites like wiKenilworth to do the job instead. But now it seems you're not allowed to. This isn't good enough. Personally I think they have all forgotten the big Society. On one hand we have what a pain twitter and face book are because it is all out of hand and on the other we have no one watches or reads or is interested. Well I have learnt more about our local community upwards on twitter and like minded people than ever I did anywhere else. so I applaud Twitter still hate face book and think the Helicopter does the most interesting tweeting. On a final note if the House Of Commons can be broadcast real time so can our local councils. Whats the biggest tragedy here? The dreadful contents of the report or not being able to record the discussion of it?